Papergreat: "Looks a little like 'Leroy' doesn't it." "Looks a little like 'Leroy' doesn't it." is the entirety of the handwritten note on the back of this vintage postcard of Lyman Run Dam in Potter County, Pennsylvania. 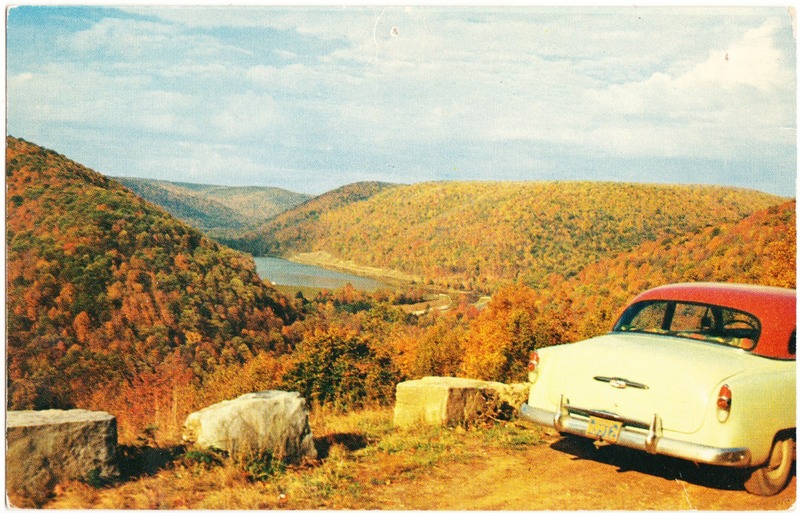 The postcard, an Ektachrome by Richard C. Miller that was published by Modern-Ad of Butler, Pennsylvania, was mailed from Port Allegany, Pennsylvania, with a two-cent Jefferson stamp sometime in the 1950s (the postmark is obscured). There are more than a dozen places named Leroy (or slight variations of Leroy) in the United States, so I reckon the writer could be referring to one of those. LYMAN RUN DAM, located 8 miles southwest of Galeton, Pa., near Germania. The lake provides excellent fishing and the surrounding area is noted for good deer and bear hunting. Galeton, on U.S. Rt. 6 is just west of Pennsylvania's Grand Canyon. The village of Germania doesn't have a Wikipedia page, but it does have its own Facebook page, where it is described as follows: "Germania, Pennsylvania was established by 100 Germans in 1855, looking for somewhere to live I suppose. I made this page so others from Germania that have moved away can still stop in and see some old pictures or post some of their own." Maybe someone had a car they called Leroy!